[caption id="attachment_26" align="alignleft" width="269" caption="M41A3 RC Tank"] [/caption] When buying your remote control tanks, there are some key factors that you should take into account. In terms of size, you should note that remote control tanks vary in size with some being as small as your hand with others extending to over two feet long. Most upgraded remote control tanks are also fitted with movable turrets that enable them to do 360 degree turns as well as move up and down. 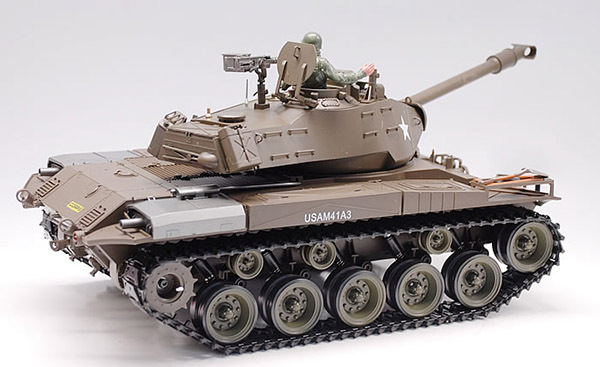 When selecting your remote control tanks, you may also want to choose those that feature firing plastic ammo, machine gun sound effects, an engine and headlights. Other great features include smoke effects emitted by the exhaust or turret which makes your remote control tank much closer to the real thing. When choosing your remote control tank, go for one whose parts or accessories are readily available. This way you will be able to replace any parts that are damaged beyond repair. With an entry level tank, you will get to enjoy the thrills of starting out with remote control toys without having to spend too much money. These normally feature smaller versions which have great sound effects and offer full control, which are especially great for kids. Remote control tanks with pre selected channels will enable you to do battle along with or against other tanks. Other cool features in remote control tanks to choose from include built in metal tracks and gearboxes. If you are looking for something that’s more top of the range, you may opt for those with upgraded metal tracks and wheels as well as a metal gear box. These features make these remote control tanks much more robust, tougher and durable, while providing the RC toy enthusiast with a great looking toy with even better grip. The tank also becomes generally more powerful because of these features. Colin Nelsen loves playing with RC toys, having grown up with them. His favorite ones are the remote control tanks - of which he has over 10 different models, and he enjoys meeting other people who share his passion for RC.